Mid-year school holidays are fast approaching and there has never been a better time to take a campervan holiday on Australia's beautiful East Coast. It's a great time to discover the gorgeous winter sun. Drag the kids out of the house and away from their computers this school break. Take them on the campervan adventure of a lifetime that they will never forget. Limit your driving distances to just a few hours per day. This will avoid tired and grumpy kids and will give you more daylight to explore what's outside. Stock up the fridge and cupboards in your campervan with snacks to avoid stopping at fast food outlets and expensive grocery stories and petrol stations. Not only will you save money, but you will probably have a wider variety available to you. Don't give them any choice but to be tired at the end of the day! Get outside and go for a hike, learn how to surf or take a dip in the ocean. The exercise alone is sure to have them tucked into bed without having to ask twice. The best way to make it impossible for your kids to be bored these holidays is to get into the great outdoors. The east coast of Australia is home to some of the world's most incredible natural attractions like the Great Barrier Reef, the Whitsunday Islands and Fraser Island. 5. But they started it! Make frequent stops to gain a degree of separation between siblings. Stretching their legs and a dose of fresh air will do them good and make them forget what the argument was about in the first place. A busy itinerary on your campervan holiday will ensure there are enough activities to go around for everyone. Get the kids to take it in turns for who gets to go first to avoid further arguments. A common question from the faint voice in the background. Avoid getting stuck in the middle of nowhere without a toilet. Hire a campervan with a toilet and shower, you'll be glad you did! 8. Will you play with me? There are plenty of great games to play while travelling in your campervan including "I Spy", "Who Am I", "The Alphabet Game" and "Rock, Paper, Scissors". 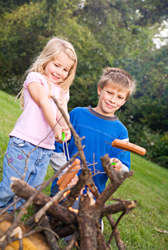 While camping, campgrounds are full of children of all ages who want to play day after day. Mum & Dad might even get in some relaxtion time for themselves! A beach holiday is a great idea for those who like to get close to nature and feel the sand between their toes. The best part is, no shoes are required. If there is one thing you must remember to pack, make sure it's your MP3 player. Mix CD's will also be a great back up for when you have exhausted your playlists and the radio. If you require further assistance, call us today on 1800 704 332 or +61 7 3442 2900. So get the kids out of the house these holidays and get in before all the campervans get snapped up!